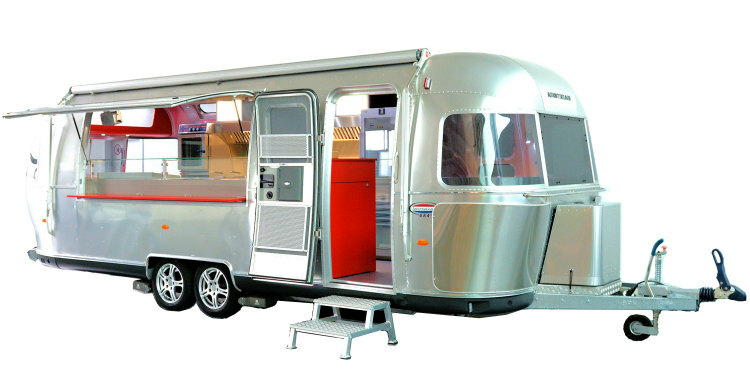 Airstream Diner made by ROKA Werk – the only of official licensing partner for commercial Airstreams in Europe! Roka Werk GmbH is a leading manufacturer of premium catering trailers in Europe and has more than 50 years of experience in building professional kitchens. To meet the needs of our customers, Roka Werk has developed a series of Airstream catering trailers together with Airstream in USA. These commercial Airstreams are based on the latest European Airstream models and fitted up at the Roka factory in Germany. Roka is the only official licenced upfitter for Airstreams in Europe. 5.3 meter body length and a maximum weight of 1900 KG make this Airstream Diner the perfect, spacious but still lightweight partner for your street food concepts. Spectacular 8.2 metres total length and 6.8 meters in body length make this Airstream Diner an approximately 17 square meters space. In addition to the standardized and Diner one and Airstream develop weight-optimized models of Airstream Diner XL and according to customer specifications, we produce custom vehicles. Here you will find some of our projects of in recent years. Here you will find a couple of custom made projects. For further assistance please dont hesitate to contact us.